The lead architect for Port St George is Studio Hillier, the Princeton, New Jersey architectural firm of J. Robert and Barbara Hillier. The Hilliers have been honoured with over 350 design awards and projects of this scope are not new to them as they have designed many major projects around the USA, as well as in international destinations as diverse as Antigua; Bermuda, London, England and Sydney, Australia. Take a look at their website – www.studiohillier.com - for details of their vast experience and track record. Their stated aim is to make Port St George the most comfortable, desirable, aesthetically appealing and sustainable destination in The Bahamas. Studio Hillier will be incorporating the best available technology into both the infrastructure and the residential and commercial buildings in order to meet that commitment. 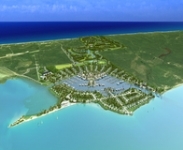 Studio Hillier will be appointing Archventure Limited of Nassau as the architect of record in The Bahamas. The two architectural practices have worked together in the past, so this represents the continuation of a solid existing relationship.